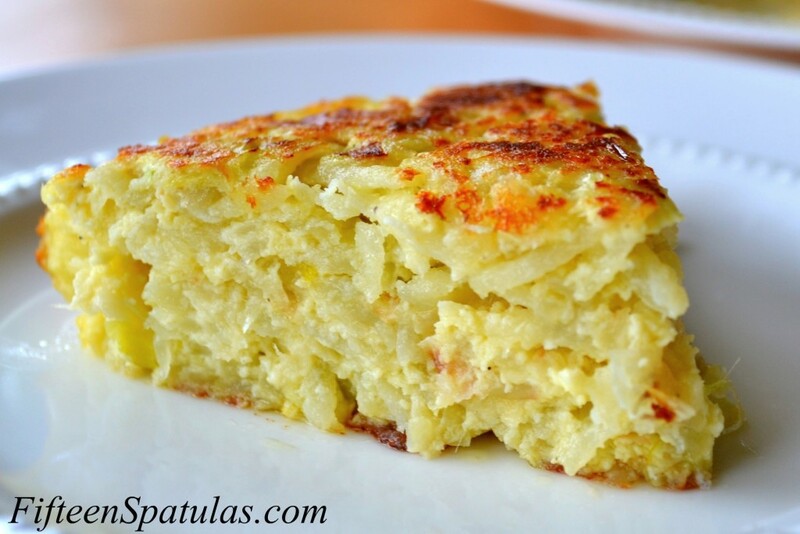 Spanish tortilla is a potato and egg omelette that’s served in slices. This version is flavored with delicious sautéed leeks and nutty manchego cheese, for a simple and delicious brunch recipe! I ate Spanish tortilla at least a hundred times during my four and half months living abroad in Spain. And in case you’ve never had Spanish tortilla, it’s nothing like a Mexican flour or corn tortilla. It’s basically a big slice of potato omelet, and is often served as a tapa (if you go out and order a drink, they bring you one of these as a snack). Here I infused the flavor of the leeks into the olive oil I cooked the tortilla in, to give it a really aromatic flavor, and I also added some nutty Spanish manchego sheep’s milk cheese to bring together all the flavors. 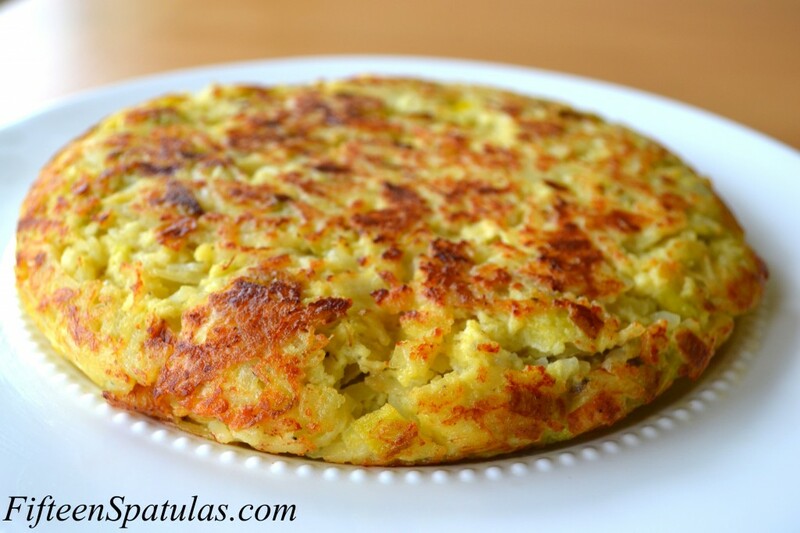 Spanish tortilla is a potato and egg omelette that's served in slices. This version is flavored with delicious sautéed leeks and nutty manchego cheese, for a simple and delicious brunch recipe! In a small saucepan, heat up the olive oil over medium heat. Test the heat of the oil by tossing in a small piece of leek, and if it sizzles, proceed with adding all the leeks to the oil. Season with salt and black pepper, and cook for 5-7 minutes until the leeks have softened. Remove the leeks from the oil to a bowl, and set it aside. Add the grated potatoes to the oil, season with salt and pepper, and cook for 7-8 minutes until they are tender but still a little al dente. Remove the potatoes from the oil and add to the leeks. You should have a few tablespoons of oil left in the pan, and we are going to use this oil to cook the tortillas. Whisk the eggs with a pinch of salt and pepper until the yolks and whites are blended. Add the eggs to the leeks and potatoes, then add in the manchego cheese. Stir to combine. Heat up an 8 inch nonstick skillet over medium heat, then add a tablespoon of the leek infused olive oil. Pour in half of the leek potato mixture, and let it cook for 3 minutes until you get a browned bottom. After it has browned a little bit, redistribute the potatoes and break the clumps up and cook for 3 more minutes until the majority of the spanish tortilla has solidified. Press the tortilla down with a spatula to compact it into a cohesive pancake, and cook for 2 more minutes. Slide the tortilla off onto a plate so you can invert it back into the frying pan. Cook for another 5 minutes until golden brown and cooked through. Remove from the pan and cook the other tortilla. Cut into wedges and serve warm or at room temperature. Enjoy! Joanne, YES! The SECOND tortilla I ever make will most definitely have to be this one. brillante! 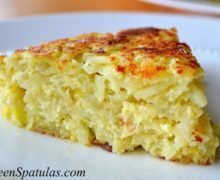 I’m so glad you posted this step by step guide…I’ve tried numerous time to make Spanish tortilla since we left, and it always end up being a messy clump of half cooked egg and uncooked potatoes. So thanks for the guide! !